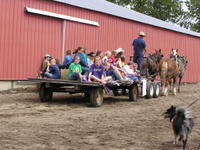 Fair time in FerryCounty is a sure sign that fall is on the way. I took 3 horses up and hooked them up in a Unicorn Hitch to have enough horses to pull all the 4-H kids. Last year there were so many kids on the Hay Wagon that the tires went flat and the team could barely pull them through the soft Arena in front of the Grand Stands. On Saturday night when the Pony Express riders from the Rez getting whooping it up and kids at the Barn Dance go wandering around the grounds, someone let out some of the cows that are in the Wild Cow Ride and someone else let out the 4-H hogs and they got out on the State Hwy. Luckily no-one was injured and except for a couple of cows, everything got put back to normal. I've hit a groove of sorts with my painting. With constant work I've developed my own method of working and applying paint/drawing to canvas. 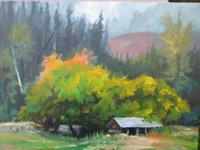 The intense colors of fall helps me distinguish the difference between values and color. Including a subject, such as a building in the painting to set off the landscape has been working well. It's easier to come up with a good painting when the subject matter lends itself to the final effort. At the same time I am learning how to interject what I think makes for a better painting. Using imagination to manipulate the information in front of me rather than being a 'camera' and recording the moment has helped composition. What is in front of me is simply a point of departure. I am beginning to feel that my own 'voice' is coming through. Vision is two fold. One, what one sees and then records. Two, what one has inside that what is outside brings to the picture. I'm beginning to look for those images that lend themselves to what I want to say. It's exciting to begin to percieve what comes out of my hand can reflect what I feel inside.